I was born in Belle Chasse Louisiana. My love of technology took me to Tech University where I majored in Computer Engineering. A temporary job for some gas money evolved into 19 year career managing an optical shop in New Orleans. Now, I am a REALTOR® applying my passion for service and today's technology to show, and sell real estate. 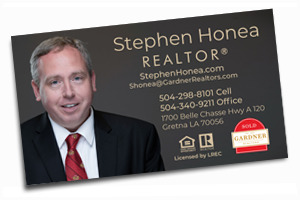 I have chosen GARDNER, REALTORS® as my broker because of their high standards, extensive history in the New Orleans Region, and their Global connection. REALTORS® are real estate agents that abide by a higher standard of ethics. Like REALTORS®, Gardner holds it's agents to a higher standard, as well. GARDNER, REALTORS® is one of the largest and most successful non-franchised real estate companies. It's ties to the Leading Real Estate Companies of the World gives it a global presence. Like the slogan says, home grown, locally owned, and internationally known. I've earned the Leading Real Estate Companies of the World Service Expert "LSE" designation. This certification is focused on meeting client expectations, delivering great service, expressing gratitude, effective communication, active listening and accountability. I've also acquired the "LMS" designation, which develops marketing strategies leveraging data to reach and engage customers on both a local and global scale. Listings are marketed to modern consumers on both social networks and specific market niches. I have a genuine appreciation for building relationships. The key to cultivating lasting relationships is communication and loyalty. My clients will always come first. Some real estate agents feel successful when they sell property. I feel successful when relationships continue long after the sale. My Experience with Stephen Honea was Marvelous. He is very pleasant , respectable, and honest. Stephen is a person I can trust who is fair with himself and other, his energy is always welcoming. I am so grateful I met him in my lifetime. He is overall an awesome person.